At least the cartoon-y shots are still amusing. Ep04 quickly began with Yune attempting to see if she would enjoy cheese with some soy sauce, with Claude and Oscar catching her. (Despite how much I adore soy sauce, that sounds pretty disgusting...) After Claude was visibly upset with the pungent smell of the sauce, Oscar got him to agree to a Japanese dinner the next day. It was incredibly close-minded of him to stubbornly say that, if he didn't like what she cooked, then it would never happen again. There's lots of different kinds of food, okay? You can't judge an entire cooking style based on one dish (Yune promised sukiyaki). I'd rant more about his close-mindedness, but I do have to remember that he never signed up to learn more about Japan. In fact, considering Yune is the one that decided to go to Paris, it's safe to say that Claude isn't really in the wrong for not wanting to be exposed to Japanese things; Yune has the role of becoming more of a fit for Paris. It sounds bad, but it's true. She almost sounded like a man, dreaming about these things. Anyway, that was just the opening. Alice's butler dropped by the store to extend an invitation for tea to Yune (as it had been discussed the precious episode). 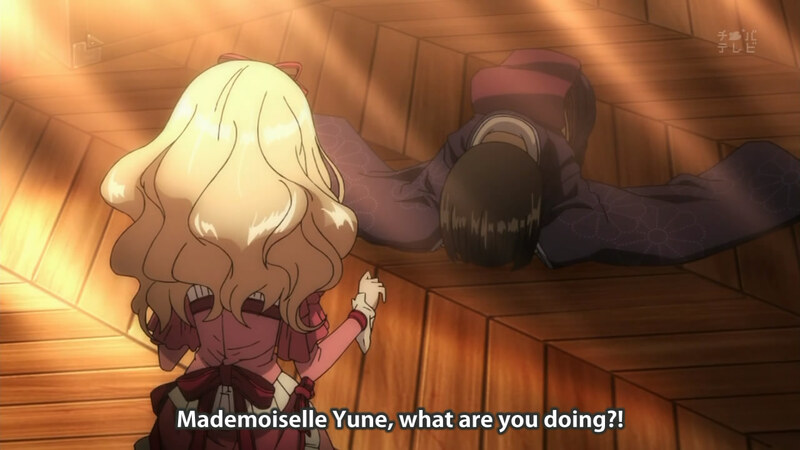 The scene cut to Alice, who was soaking in her tub and dreaming about Japanese bathhouses, when her butler returned with the sad news that Yune had declined. (A quick flashback showed that Claude was pretty against Yune going to a party, citing that she wasn't ready for it yet. It makes sense; not all people are "big-hearted" enough to accept such a different person.) The bath motif continued as Claude stumbled on a mostly-naked Yune about to submerge herself in bathwater. The ensuing clamour caused the water to spill everywhere, and Oscar arrived on the scene to find the two frantically cleaning up. I wonder how true it is that French people didn't bathe everyday. I'm sure water was a difficult commodity, especially for the poor, but I wonder if it's not pointing more to the fact that Yune is from a rich family (considering Oscar's claim that she bathed everyday in Japan). Either way, Claude saw the predicament and decided to take her to a public bathhouse. (I wish they had shown it; I can't fathom what a Parisian bathhouse would look like...) That was when Alice showed up, previously unhappy that Claude had gotten in the way of her plans. She immediately showed her spoiled attitude, by proclaiming that she wanted to take Yune home and asking Oscar how much he wanted for her. I don't know why no one took some serious offence with that idea; it sounds much like slavery. To his credit, Claude did rush out with Yune at the first chance he got. 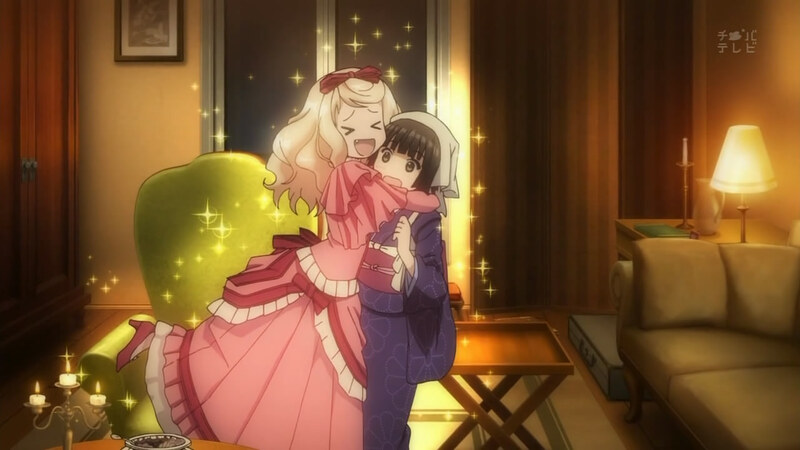 Alice followed persistently, attempting to sway Yune to come live at her mansion instead. Her eyes are quite clearly some kind of dark green. Is it not shameful to lower one's head so often? While Yune was away, Claude was pretty emo, especially when a neighbouring shopkeeper (and friend, by the looks of it) suggested that he had wondered how long the "babysitting" would last, and had fully expected Yune to leave sooner than later. This sent Claude into a spiralling depression, wherein he began thinking that it was in Yune's best interests to stay with Alice, someone that could give her comforts instead of hardship. 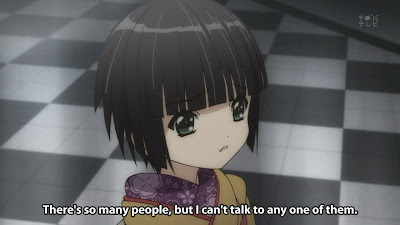 As expected, Yune ended up returning - apparently after having to beg to Alice for an hour. 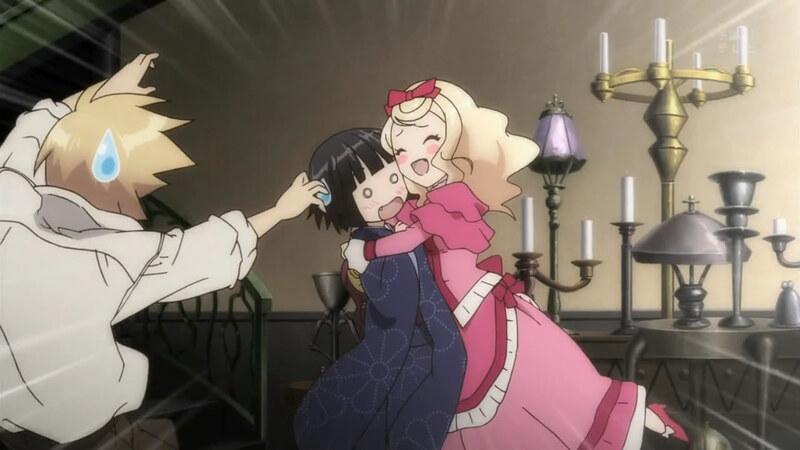 (That kind of points to the fact that Alice had initially, however seriously or not, planned to "forcibly" keep Yune there...) Alice had initially tried to bribe Yune by giving her back her mother's treasured kimono, in return for her staying there, but Yune firmly declined because she wanted to believe in Claude (also the reason why she declined when Alice, out of the goodness of her heart, offered the kimono back without any strings attached). 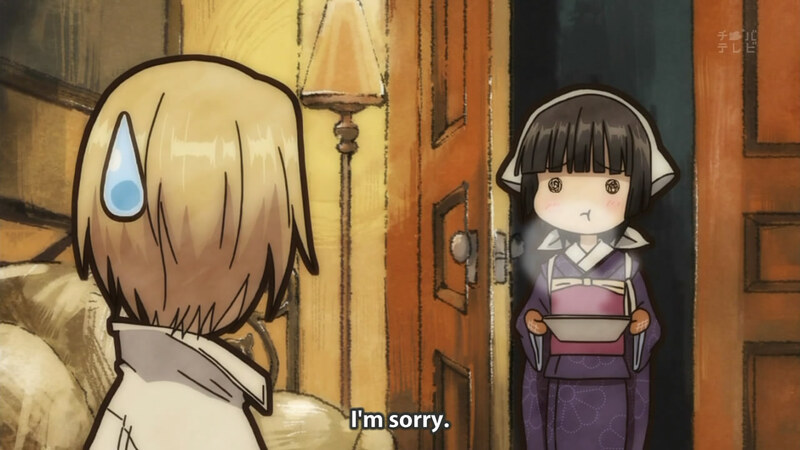 The episode ended with sukiyaki being "enjoyed" by all. The need to watch is so great. Ep05 was perhaps, even worse, since it embodied a lot of the tripe usually associated with things like "being nice" and "innocent girl". The episode began with Claude asking Yune to not stare at him as he worked (at first praising her quite a lot, so perhaps he's changed a good deal...). Yune's reaction and fix to the solution (hiding behind a wall to continue staring at him) was kind of funny, but it was the only remotely amusing thing about this episode. Oscar suggested that, in order to get his "peace", he give Yune something to do, so Claude told her to go polish all the lamps at the store-front. It made me wonder why there were so many lamps, but I guess it's a metalworks shop, not just a sign-making one. Shop attendants aren't salespeople, hm. 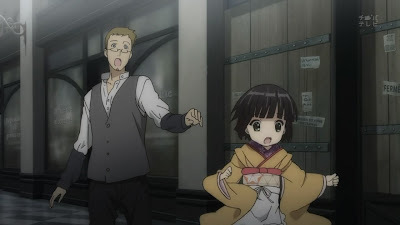 Yune's warm-hearted approach to a potential customer standing outside did not end well (with the customer running off), and so Claude took it upon himself to give her a few lessons. Apparently, smiling and being friendly is a sign for distrust, as the person is bound to be hiding something. Such paranoia... It exists pretty much everywhere, sometimes even in my native Toronto (although unfriendly behaviour is often rare to find). 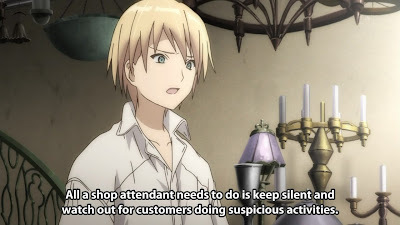 It was amusing that Claude would say that an attendant should stay away from customers in order to not drive them away; salesmanship filled with fake pleasantries seems to be the norm these days. At any rate, Yune was aghast at his teachings and so began a very obvious plot point of her learning the hard way. On a rainy day while Yune was minding the shop, the "dirty" child that she had seen earlier came in. Not paying attention to what Claude had taught her in the slightest, she attempted to be a salesperson - and the boy ran off with a stolen candelabra. It's sad that the anime chose to go such a stereotypical route; typecasting a poor child to be a thief is pretty annoying, despite what statistics reality may show. At any rate, Yune mindlessly ran off after him - I say "mindlessly" because the shop was pretty unguarded since Claude was in the back and only coincidentally found out that Yune had left. She ran and ran and ran, and then (of course) lost the boy. Despite knowing the language, she was unable to ask for assistance in locating the thief, because she chose to ask busy people that were busy. Sadly, she didn't seem to understand anything of what was going on around her; when a crowd stopped to watch a street performance, she could have easily asked many of the people, since most of them weren't really preoccupied. Given how many people were in the crowd, it's sad that she gave up without even trying. Distrusting the good ones. Typical. All the while, Claude attempted to find her by running through the gallery, asking his fellow shopkeepers to keep an eye out for her. 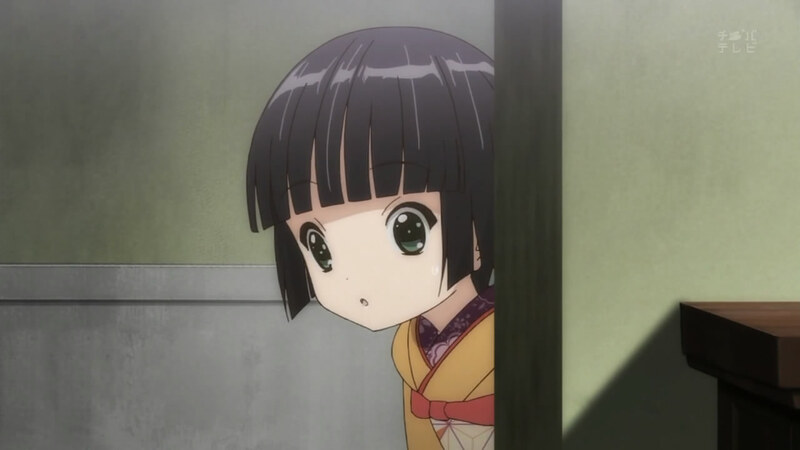 Yune, thoroughly lost, attempted to step outside but got sidestepped by a shady-looking person near the exit. It's funny how the shady-looking person didn't even seem like he was thinking about doing anything to her. Her misunderstood lessons continued when a neighbouring shopkeeper found her (the same one that was seen with Claude in the previous episode) and, having approached her with a smile, Yune immediately thought that he was shady and ran off. It was just cliche after cliche. As she ran blindly, she fell into Claude, who gently calmed her down. I was hoping some kind of lecture would follow, but it didn't. Thief with a heart of gold. 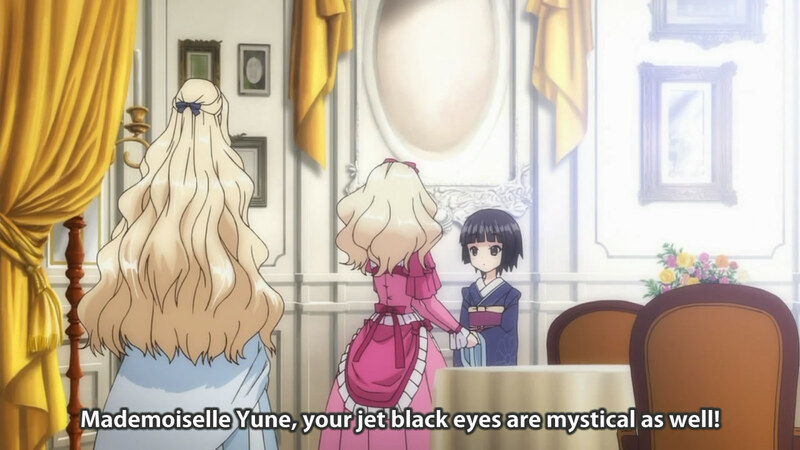 By the end of the episode, Yune had "apparently" learned the true meaning of Claude's lessons. I'm a little confused about what it was, but I think the idea was to get her to stop being so trusting of strangers, but to also recognize friends. It's sad that a person so old needs to be taught that; I'd assume that such lessons would be provided in childhood. I guess Yune was pretty sheltered. 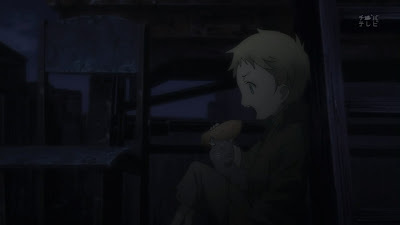 The appearance of the homeless boy (and the cat!) after the ED made it obvious that he would probably show up again. I hope it's not some nonsense about him finding redemption (it was shown that he sold the candelabra, using the proceeds for the bread); without more information, I can't fault him for stealing to feed himself. Alice will now be around for comedy and money.